Definition at line 246 of file lscript_tree.h. Definition at line 249 of file lscript_tree.h. Definition at line 258 of file lscript_tree.h. 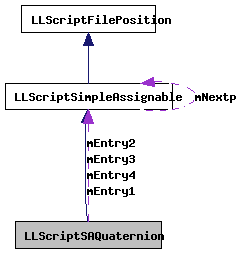 Definition at line 997 of file lscript_tree.cpp. References LLScriptSimpleAssignable::getSize(), mEntry1, mEntry2, mEntry3, and mEntry4. 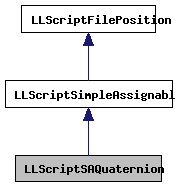 Definition at line 830 of file lscript_tree.cpp. References bytestream2quaternion(), bytestream_int2float(), FALSE, gErrorToText, LLScriptGenerateErrorText::getErrors(), is_SA_constant_integer(), legal_assignment(), list, LSCP_EMIT_ASSEMBLY, LSCP_EMIT_BYTE_CODE, LSCP_EMIT_CIL_ASSEMBLY, LSCP_LIST_BUILD_SIMPLE, LSCP_PRETTY_PRINT, LSCP_TYPE, LSERROR_TYPE_MISMATCH, LST_FLOATINGPOINT, LST_INTEGER, LST_QUATERNION, LLScriptByteCodeChunk::mCodeChunk, LLScriptByteCodeChunk::mCurrentOffset, mEntry1, mEntry2, mEntry3, mEntry4, LLScriptSimpleAssignable::mNextp, NULL, print_cil_cast(), LLScriptSimpleAssignable::recurse(), S32, and LLScriptGenerateErrorText::writeError(). Definition at line 265 of file lscript_tree.h. Definition at line 266 of file lscript_tree.h. Definition at line 267 of file lscript_tree.h. Definition at line 268 of file lscript_tree.h.